Our incredible Bungee Flight Adrenaline Rush workouts are gravity-defying classes that make fitness fun again! The high-intensity, low-impact class will target every muscle in your body as you pull, push, and fly through strength and cardio sequences. You can float weightlessly over the floor, hang upside down, and swing through the air – it’s like being at an adult playground. 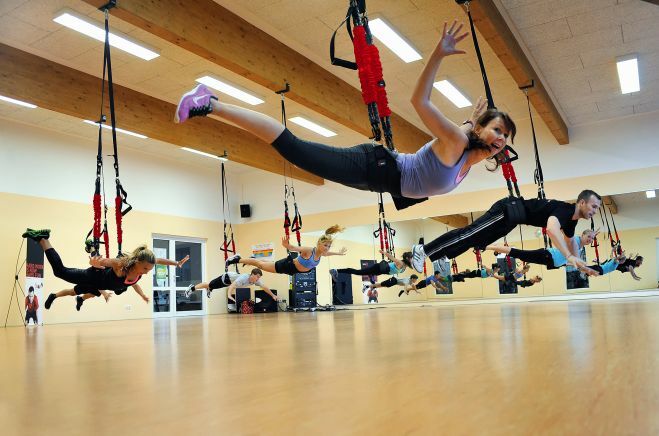 This is your chance to suspend your belief, defy gravity, and soar your way to a better body. This class is appropriate for ages 10 and up (those under 18 with parental consent) and is perfect for all fitness levels. Each participant starts at their own level and builds up the intensity from that point on. *There is a 260-pound weight limit per Bungee for safety reasons. As a courtesy to other Flyers and our Instructors, we ask that you cancel 12 hours before the scheduled class or you will have to forfeit class credit, especially since most Bungee classes sell out and have waiting lists. If classes are sold out and you do not cancel prior to the scheduled time, then you will forfeit that class. If a class is full, join the waitlist! We will add Flyers on a first-come, first-served basis as bungees become available. If you’re on our waitlist and cannot attend class, remove yourself to avoid a class penalty.